Ricoeur distinguishes himself from many figures writing in hermeneutics and the natural sciences in that he does not strictly grant the hierarchical orientations proposed by Robert Crease:2 1. The priority of meaning over technique 2. The primacy of practical over theoretical 3. The primacy of situation over abstract formalisation However, neither does Ricoeur endorse the reverse order. Instead he sees each term as equiprimordial. It is on this point that Ricoeur's philosophy comes closer to the natural sciences than phenomenology would traditionally tolerate. However, Ricoeur's notion of objective reality is far removed from transcendental realism. He argues for a dialectical "middle way" that undercuts the dualism of subjectivity and objectivity by showing their mutual implication and logical dependence.3 The effect is to grant legitimacy to the methods of the natural sciences without falling victim to the estrangements of either transcendental realism or transcendental egoism. Ricoeur's "middle way" can be distinguished from the mainstream Heideggerian form of hermeneutics if we consider how he would respond to the following proposition from Patrick Heelan: What kind of entity then is a hammer...? It is a public cultural reality, a physical reality constituted by socio-cultural meaning. "4 I suggest that Ricoeur would demure that the hammer, or any physical object, is not merely constituted by a socio-cultural meaning since meanings cannot constitute anything but other meanings. We do not resolve the problem of realism by appeal to the "as" structure of language, since this does not engage directly with the physicality of a physical object. 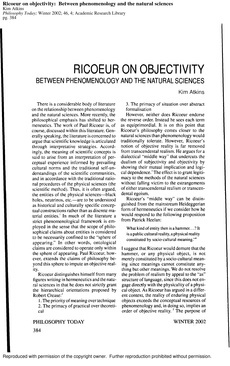 As Ricoeur has argued in a different context, the reality of enduring physical objects exceeds the conceptual resources of phenomenology and, in doing so, implies an order of objective reality.5 The purpose of this essay is to examine the ways in which Ricoeur has articulated his particular form of phenomenology and its notion of objectivity in three different philosophical contexts.6 Ricoeur's arguments for objectivity appear variously as arguments concerning the nature of explanation and understanding, extra-linguistic reality, cosmological time, historical causality and, most recently, the neuronal basis of mental life.7 will be considering only three: explanation and understanding, cosmological time, and the neuronal basis of mental life. While the arguments for ontological reference that appear in the Rule of Metaphor would be entirely appropriate here, they have received considerable attention elsewhere,8 so for reasons of economy I have omitted that discussion.